Do you ever feel like your home life is a whirlwind of chaos with the inmates running the asylum? Are you stretched to the point of breaking? If so, you’re not alone. Research shows modern moms have way more pressure placed on us than our mothers or grandmothers ever did. We spend more time in the work force, more time actively caring for our children and yet there aren’t more hours in a day than there were 30 years ago. According to the Pew Research Center, moms do more when it comes to managing their children’s schedules and activities than dads do, even in dual, full-time working households where the division of labor is considered equitable. To sum up, the time we spend working is higher than ever, the time we spend parenting our children is higher than ever and even in the most equitable of relationships, we are taking the lead in managing our kids’ schedules and activities. But there’s hope. There’s one area where we can take charge to lighten our load. We can implement a family blueprint. A family blueprint lays out a plan for the household. It provides positive boundaries. Instead of coming from the negative stance of “You can’t______,” a family blueprint focuses on what you can and will do. When implemented well, you don’t feel deprived when you say “no” to something because there’s no fear of missing out. The blueprint reminds you what’s important and what’s not, so you can filter competing priorities in a way that suits you and your family best. 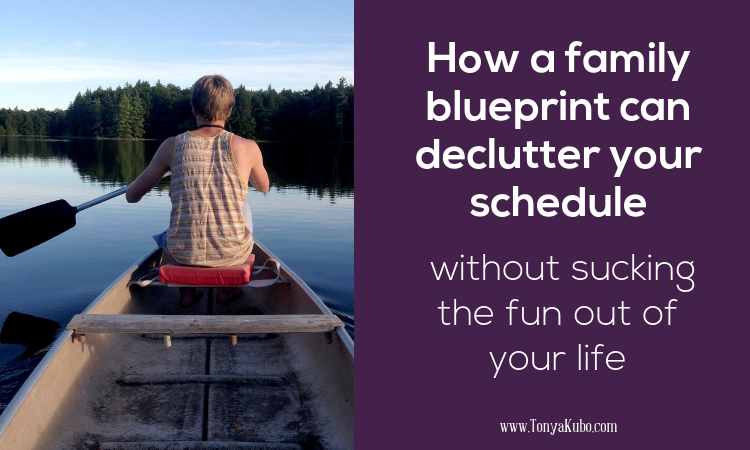 It’s how you declutter your schedule without sucking the fun out of life. I like to think of our family blueprint as guiding principles. Any time we get an opportunity or question whether we should do something, we check the blueprint. If we’re having family conflict, we check the blueprint. We even reference the blueprint when we’re planning meals or family activities. If what we’re discussing doesn’t align with our blueprint, we decline. The blueprint helps us to achieve consensus on what our family should and should not do. It helps us say “no,” mean it and feel good about it. What does a family blueprint look like? Our family blueprint has seven guiding principles that represent what we value. I think five is the minimum and ten is the max. You want enough guidelines to provide a broad framework to filter decisions but not so many that it’s overwhelming. That would defeat the purpose. This is the first and most important to us. 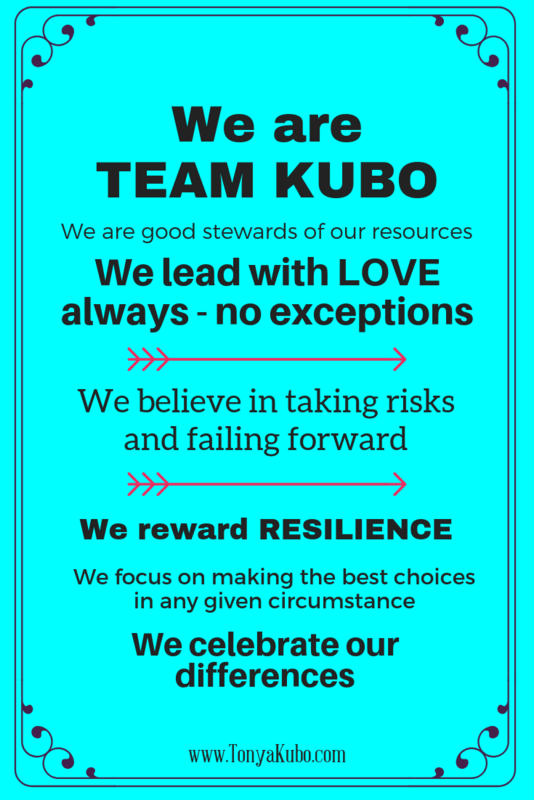 We are a team, and that means if something doesn’t work for all of us, it doesn’t work for any of us. Our family has a liberal definition of resources. We consider time, money, energy, food and material possessions to be among our limited resources, and we strive to be wise in how they are allocated. We love people because of who they are, not in spite of it. Even in hard conversations and the discipline of our children, we opt for the most loving solution appropriate to the situation. This principle is as much for me as it is for anyone, but it’s a good reminder to all of us that we need to feel the fear and do it anyway — whatever “it” might be. If we’re going to take risks, we’re going to fail. It’s a statistical guarantee. You can’t win them all. This guideline ensures that we praise and promote dusting ourselves off and trying again. We are never going to have all the information needed to make the right decision all the time. But what we can do is give ourselves permission to make the best choice based on the information at hand. If we focus on the differences in our family, there would be never-ending conflict, tears and angry outbursts. So, we embrace it and celebrate the differences and the richness they bring to our family. Now that you know the basics of a family blueprint, and you’ve seen one explained, it’s your turn. Get out a piece of paper or open a document on your computer and start brainstorming guidelines for your family. Want to make it even better? Brainstorm with your family. Get the kids involved, too. People — even little people — support that which they help to create. What is non-negotiable in our home? Once you get your ideas down, look for themes. A family blueprint is somewhat aspirational so think of area where you want to see improvement and create a principle around it. Mine is perfectionism. Yours might be running late, yelling, name-calling, materialism, or something else. Write it down. Aim for five principles to start your blueprint. Write them on a piece of paper and hang on the fridge or other high-traffic area to live with it for a couple of weeks. Then revisit it with your family and revise as needed. Do any needed to be removed? Are there new ones to create? Remember to limit your family blueprint to no more than ten principles for maximum effectiveness. One you have a family blueprint that works for your household, type it up on pretty paper and hang it for everyone to see. Ours is in a page protector on the fridge. You can frame yours — whatever it takes to make it a family focus. Though you could copy our family blueprint for a jumpstart, you’ll probably achieve better success coming up with one that fits your family’s unique needs. Post any questions you have in the comments. If you have a family blueprint of your own, please share it here. 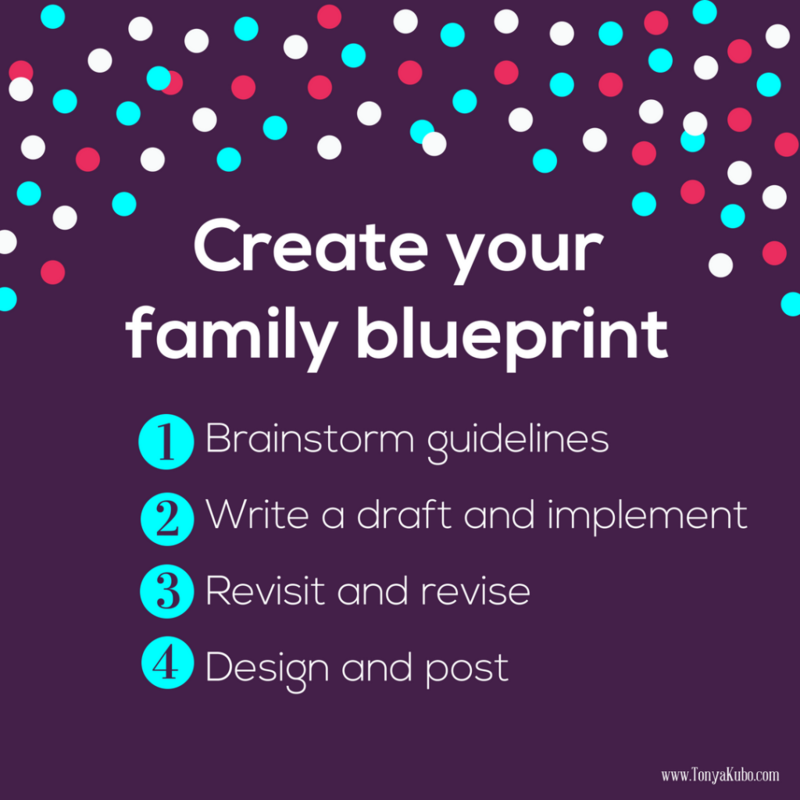 I love the idea of a family blue print! Going to be working on this soon. Please share it when you’re ready. I’d love to see what your family decides on!